From left to right: Write-ability mentor Thalia Kalkipsakis, writer Kate Morell and Publishability Project Officer, writer and advocate Jax Jacki Brown. Photo credit: Kylie Esler. The Writers Victoria Publishability program provides support to emerging writers with a disability. Launched in late 2018, it is funded by Creative Victoria and backed by publishers, including Allen & Unwin, Echo Publishing, Hachette, Penguin Random House and the Lifted Brow. The two-year initiative will support four talented writers with a disability by providing mentorship, editing, professional development opportunities and financial support. The need for such a program is telling. Despite over four million Australians having some form of disability, there’s a general lack of awareness about writers with a disability, says one of the program’s fellowship recipients, writer, editor and podcaster, Fiona Murphy. Fiona is one of the first two writers awarded fellowships into the program, along with Young Adult fiction writer Mary Borsellino. Two further writers will be appointed later this year. During her fellowship, which began late last year, Fiona starting work on 'The Shape of Sound' — a memoir about her experiences of gaining Deaf pride [see note below]. 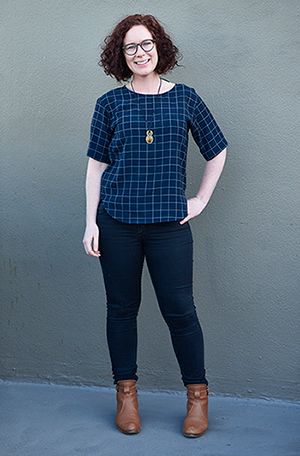 "My manuscript explores my specific experiences as a Deaf woman — even though I was born deaf, I didn’t have access to Auslan growing up and I’ve never worn hearing aids," says Fiona. "The fellowship has provided me with financial support and mentorship to polish my manuscript; I feel like I’ve gained an invaluable set of skills and my writing voice is beginning to mature." Fiona’s manuscript was shortlisted for the 2018 Richell Prize and highly commended in the Wheeler Centre’s Next Chapter Fellowship. "The program was all about giving writers with a disability a chance to tell their stories and build professional careers," Fiona says. "I’ve experienced exciting writing milestones, including speaking on a panel at the 2018 Emerging Writers Festival and attending literary events in Melbourne and regional Victoria. Plus, I’ve connected with the Victorian writing community and met industry professionals." To say the program’s impact has been life-changing for her is an understatement. "As a child," Fiona confesses, "the only book I read featuring a Deaf person was Helen Keller’s biography: her story portrays deafness as something she was able to overcome, almost as if she were superhuman. This left me feeling inadequate and isolated, as at the time I was struggling with school. To me, deafness felt like an impossible burden. It was only as I got older that I realised how common deafness is and how diverse deaf experiences can be. Having books written by people with lived experiences ensures there are more nuanced stories about disability." Jax Jacki Brown, herself a writer with lived experience of disability, is coordinating delivery of the Publishability program, and has provided mentorship to Fiona. “We met regularly over a six-month period," explains Fiona of the mentorship with Jax. "By learning about disability politics and the social model of disability, I developed a strong sense of disability pride. From there, I became more connected with the Victorian disability arts community, which is a vibrant and exciting scene. It was because of Jax’s supportive mentorship that I was able to write the essay ‘Discrimination and the body: The Able Australia policy’, which was published in the Griffith Review." Around one in five Australians have a disability; however, their voices are rarely heard in our cultural and media narratives. A report by Screen Australia found that only 10 per cent of TV dramas included a main character with a disability, and within those programs only four per cent of characters had a disability. People with disability are similarly under-represented in the creative sectors – evidence we still have a long, long way to go in the equality stakes. "When those statistics are analysed," says Fiona, "the lack of diversity in the film industry is dire. While there are four per cent of characters with a disability, these stories are frequently a negative portrayal of disability. The lack of nuance and complexity perpetuates the belief that disability is a tragedy, and the characters that do appear on Australian television are overwhelmingly straight, white men. Frustratingly, most disabled characters are played by abled-bodied actors. "There are also significant barriers to accessing the publishing industry. The program is working to create a more inclusive publishing environment by providing Australian publishers with disability awareness training. As a disabled writer, this is tremendously exciting." Fiona’s Publishability fellowship ends in August 2019, with hopes of publication in the future. For more details, visit the Writers Victoria website. There’s another layer of consideration when referring to a person who is deaf. In writing this article, Fiona kindly educated us on the usual protocol among deaf people. Uppercase 'Deaf' means the person uses Auslan (Australian Sign language) and self-identifies as being a part of the Deaf community. Lower case ‘deaf’ refers to the adjective, and all people who are deaf. 'Hard of hearing' (rather than 'hearing impaired' which implies a negative loss of function) is the preferred term for people who do not identify with the Deaf community. Please refer to the Disability Advocacy Resource Unit for more resources.